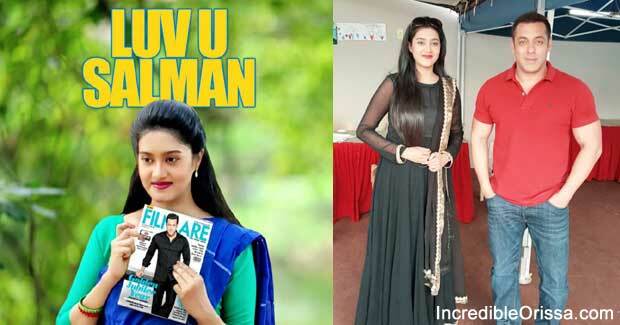 Ollywood actress Barsha Priyadarshini is trying to cast Bollywood superstar Salman Khan in her upcoming Odia movie – Luv U Salman. We know that Barsha’s husband and Ollywood superstar Anubhav Mohanty is a big fan of Salman Khan and both have clicked photos together recently. Anubhav praised Varsha’s big step in a long Facebook status update and appreciated the hard work, dedication and devotion of his wife towards the movie which is in the pipeline. Confessing that he saw a total different personality of Varsha in the past few days, Anubhav revealed that he was surprised to find her so sincere in order to perfect the minute details of film. He in fact, goes on to describe her as a shy, docile, feeble and a very soft person as a colleague, friend and wife. If Barsha Priyadarshini will succeed to bring Salman Khan to Ollywood, then the Odia film (Luv U Salman) could become a blockbuster for sure. Best of luck Barsha for your dream project!